Tired of the usual generic mainstream cinema? Or the exorbitant ticket prices at the multiplex? Here’s a list of places that show a good mix of cinema — world cinema, Hollywood classics and blockbusters, indie gems and documentaries. And entry is free! 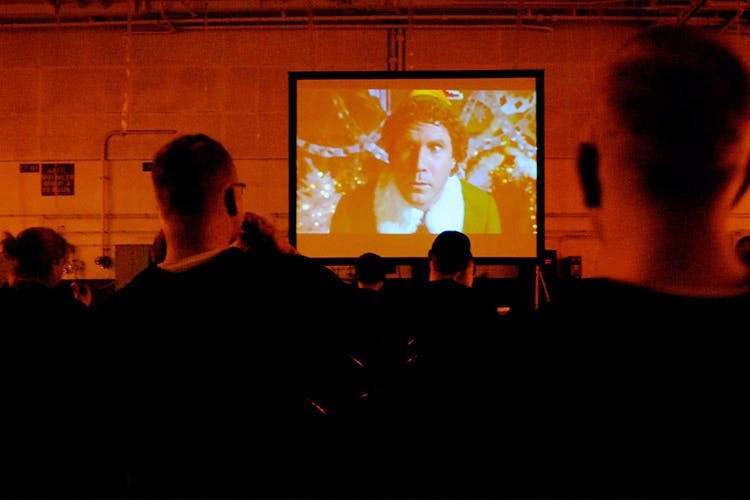 And just saying, film screenings are a surprisingly good way of getting to know people. Formed in 2013, PFC is an independent, autonomous, people-funded cultural-political collective based in West Bengal. They organise monthly film screenings in Kolkata. SRFTI organises weekly film screenings that are open to students and the general public alike. Films that are shown range from world movies, regional, documentaries and rare ones. In July, they had hosted an absolute treat for cinema lovers – the EU Film Festival with 22 latest and award-winning European movies from varied genres ranging from comedy to gripping family drama, romance and adventure. The department of film studies at Jadavpur University frequently hosts film screenings for the students, and if you are near the campus, you are welcome to drop by. However, you need to find out the ‘when and where’ from the notice board that is put up at the department. KiFF is the second-oldest international film festival in India held in Kolkata every year around mid-November. The perfect sanctum for cine enthusiasts, the foundation of this prestigious festival was laid by the likes of Satyajit Ray, Mrinal Sen and Ritwik Ghatak, and over the years, filmmakers from all over the globe have attended it. The movies screened at the week-long festival are free to all. The British Council Library in Kolkata hosts film screenings through the year. They are known to screen excellent documentaries and films like Chicken Run, A Clockwork Orange, Trainspotting and more. You have to join the mailing list for more info on dates and times. Passes are available at the Camac Street BCL reception. Their space is a tad small but sometimes they tie up with other venues for screenings. Their in-house Toto cafe caters at most events. Sometimes you get cheese and wine when the films are shown in their own space on Park Street. The US Consulate General Kolkata has regular film screenings at their center on Chowringhee. The auditorium is a good-sized one though on the underlit and gloomy side and the chairs at the back can be a tad uncomfortable. They screen drama, comedy, thrillers, and suspense – you can pick according to the genre you like best. So you can even catch an adaptation of Toni Morrison’s Beloved or an indie documentary like In the Shadow, based on the life-story of Jerri Zbiral, whose mother and sister survived the Nazi destruction of the Czech village of Lidice during World War II – the screening was followed by a discussion with Jerri. Kolkata had a deep bond with the USSR once upon a time. Gorky Sadan (the Russian Cultural centre in Kolkata) and its Eisenstein Cine Club is a testament to that. It was founded in February, 1981 and has supported and promoted “a socially responsible cinema”. Its focus has been largely on masters of cinema (several of them from Russia and Eastern Europe) like Eisenstein, Pudovkin, Gerasimov, Tarkovsky, Truffaut, and Godard. The Club has also played host to Indian film-makers like Satyajit Ray, Mrinal Sen and Adoor Gopalakrishnan. If you love films about dance, head to the Dance Bridges Festival this month from 22 to 29. It is an international dance festival with an emphasis on building artistic and cultural exchanges between international and local artists, and showcasing contemporary choreography through live performances and film screenings. Look out for their screenings on August 23, 26, 27 at Nandan. Passes will be available at select venues after August 15.